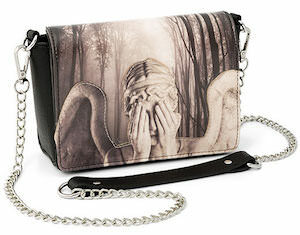 Now there is a cool Weeping Angel purse and that is something a true Doctor Who fan wants. The Doctor Who purse has a removable chain so that you can carry it around you shoulder or just in your hand. The purse shows a Weeping Angel with covered eyes but when you open the handbag then you see a completely different angel and you can see it now by clicking on the image. Inside the Doctor Who purse it has zippered compartment for things likes you credit card but there is a bigger pocket too that can hold other things like maybe your phone, hairlip and things like that. 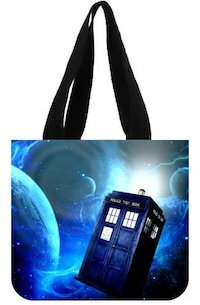 If you are a Doctor Who fan in need of a cool bag then this Tardis tote bag is what you need to see. 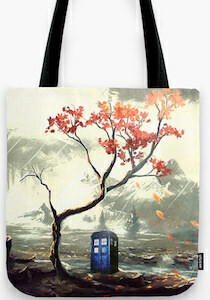 This tote bag shows an amazing landscape with a red leaved tree standing tall with the Tardis under it and yes that does mean that the Tardis is tiny compared to the tree but the colors of the scene are just amazing. You can get this Doctor Who tote bag in 3 sizes and all have a strong and comfortable handle for easy use. Now you can go to school, gym, and shopping with a Doctor Who Tardis bag that people will admire even if they don’t know Doctor Who. 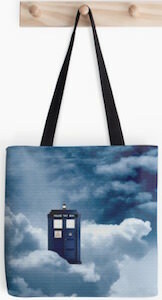 Now you can have a Tardis galaxy tote bag and I am wondering if it could be bigger on the inside. The canvas tote bag is made from 100% cotton and shows the same image on both the front and the back. And the image shows The Tardis flying through space with planets and more surrounding it. No more paper or plastic for you thanks to this Doctor Who bag you are always ready to carry your shopping, paper, clothes and more as this bag is not limiting what you put it only how much you can carry. Now there is a Tardis messenger bag for Doctor Who fans that want a cool bag for school, work and just everyday use. 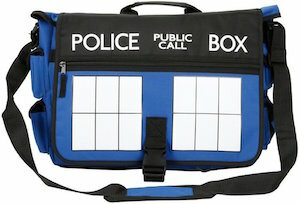 The Doctor Who messenger bag is Tardis blue with on the front the big windows and the top sign that says “Police Public Call Box”. The messenger bag has four side mini pockets, two front exterior pockets, external flat zipper pocket and interior laptop & tablet sleeves. And to carry this all there is a padded and adjustable shoulder strap. Now the world around you will know for sure that you are a Doctor Who fan just because you use this Tardis messenger bag. Now there is a tote bag for fans of the Tardis and Doctor Who. This tote bag shows an image of the clouds and there are many of them on this bag but on one of the clouds there sits the Tardis from Doctor Who and it looks like it just parked there. You will find the same Doctor Who image on both the front and the back of this tote bag. The strong Doctor Who tote bag is perfect for so many things from carrying book to groceries and the bag has a strong 1 inch wide carrying strap so that it is comfortable to take this bag everywhere. Doctor Who fans that like to go shop should be carrying this foldable Tardis tote bag so that you always have a bag handy to put you shopping in. This Tardis tote bag looks like the doors of the Tardis all folded out but when you fold it in then it becomes a little black bag that has an image of the Tardis on it and the text “It’s bigger on the inside” and that little bag can be in your jacket pocket or handbag always ready to go do some shopping without the need of a plastic bag. 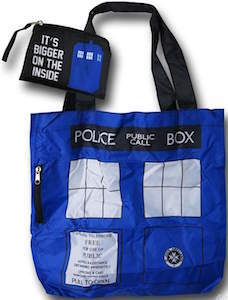 Every Doctor Who fans should be carrying this Tardis bag as it is fun, cool and good for the environment.